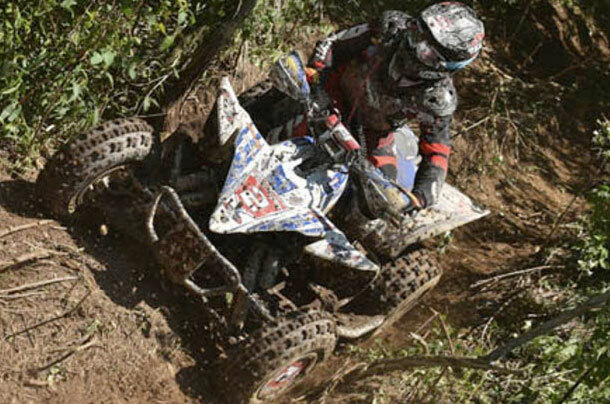 N-Fab/AmPro/Yamaha’s Cole Richardson scored his amazing sixth XC2 Pro Am ATV win of the 2015 GNCC season in Masontown, West Virginia on Saturday, May 23. The victory puts Richardson 20 points ahead in the championship with seven of 13 rounds now completed. Then in the XC1 Pro class, AmPro teammate Walker Fowler came from behind to take an inspired second overall, followed by Maxxis/SSI/Fox/Yamaha’s Chris Borich. Fowler received a time penalty early in the event for firing his engine early. The impressive ride from deep in the pack gave Fowler 25 valuable points, and he now lies second in the overall standings, 18 points behind event winner Adam McGill. And finally, Kylie Ahart claimed another second-place podium finish for Yamaha in the morning WXC race. In the XC2 Pro Am class, after faltering in the previous round, Richardson was on a mission at Masontown. He started inside the lead pack, and then worked his way ahead on the first of five laps. From there on, he simply left his pursuers in the dust, building up nearly a minute’s advantage by the end of lap two, expanding it to over two minutes after three laps, and then widening the gap to nearly five and a half minutes over Martin Christofferson at the checkered flag. Yamaha-mounted Cody Collier and Thomas Koontz, Jr. came home in fourth and fifth place, respectively, making it three Yamaha YFZ450Rs inside the top five. In the premier XC1 Pro class, Fowler got a great start but was called in to serve a time penalty at the end of lap one. When he went back out he was at the back of the pack – with a lot of work to do. But three-time 2015 race winner put his head down and began carving through the Pro field. He raced his YFZ up to fifth place by the end of the second lap, swept into podium position by lap three, and then climbed to second on the next-to-last lap. From there on, Fowler pursued McGill but could not quite catch the leader, finishing just 10.3 seconds behind, followed by Borich, after the two-hour-long race.